Fabulous card! Love the pink and green together! :) Thanks for playing along over at the Simon Says Stamp Wednesday Challenge Blog! Love your colourful creation great design.. Thanks for sharing ITP chall this time. Such a pretty card! Thanks for joining the fun at All That Stickles! It looks as though nothing will get in her way. Love your paper piecing and border punch. Thanks for joining us at Papermakeup Stamps this week. Fantastic paper piecing!! Love this cute card. Thanks for joining us at Digi Haven! Great paper piecing on an awesome image. I am very glad you entered this week at LUFP. I hope you had fun!!! See you back very soon to play in another fun challenge. Remember to get the girls checked and remind a friend! :-) Together we can beat Breast Cancer!!! Great card! Love the Sassy girl! Super cute card love the ribbon and the cute littl sassy girl!! So Cute!! Love that her pants match your background!!!! Thanks for joining our linking party!!!!! Great card!! Love how you matched her pants and background paper. Fabby idea!! I love the design and your coloring is pretty. Thanks for joining LUFP linking party and hope to see more of your creations here. Love the card, the colors and that little sassy girl!!!!! Adoreable. Great Card, would love to see more of your work! Inspiration! Lovely card. I love the image. I have just been over and ordered her. This is one of my favorite images...great card for LUFP! 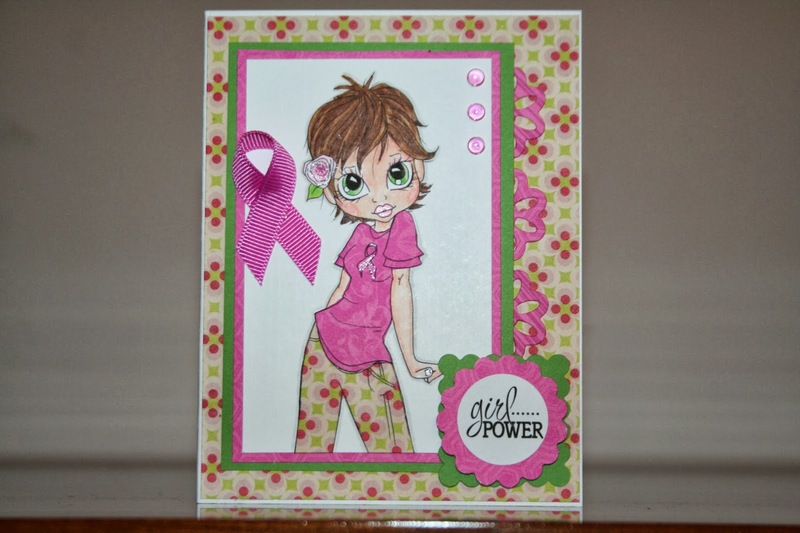 Great card, cute image and super pink colours. Thank you so much for playing with us at Paper Makeup Stamps. Beautiful Card. Thanks for playing at RCS. Great card!! Love the image and tall the pink!! Girl Power sentiment is perfect!! Thanks so much for playing along with us at Red Carpet Studio!!! Cute papers! Thanks for sharing with us at SC Challenges! So cute card!! I saw this great craetion on the LUFP!! !